If you ever walk anywhere at all, you are probably aware that dog mess is an ongoing litter problem on our footpaths and green spaces in the UK. If you ever walk on popular hiking routes you have probably also noticed that even when dog owners are picking their dog’s mess up, there seems to be a trend of leaving the bagged mess in public rather than binning it or taking it home. Why Is Dog Mess a Problem? In 2010, a survey by Keep Britain Tidy found that, of all litter types, 37% of the general public were most offended by the sight of dog fouling. 9 out of 10 dog owners in the UK clean up after their pets, but 1 in 10 owners are not doing this and that translates to a lot of mess when you consider the fact that there are approximately 9 million pet dogs in the UK! Now only does it stink, look horrible and cause a nuisance when you tread in it; dog faeces is a health hazard. Toxocariasis is a big risk for anyone in close contact with it, and can cause blindness if ingested or if contact is made with eyes. Unfortunately children are more likely to be in close contact with dog mess than adults, and the Toxocara can contaminate parks, gardens and playgrounds even when the mess has been scooped. Whilst most owners do their bit, the irresponsible ones who don’t are ruining social relations for other dogs and their owners; we are seeing an increase in the number of parks, playgrounds, buildings and other public spaces that are banning dogs. 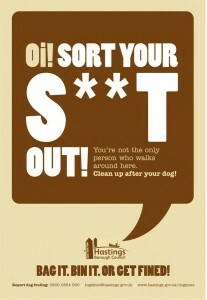 Alongside the reasons above, dog fouling is illegal in the UK, so cleaning up after your dog is a legal duty. Dog mess is a worldwide problem, and there have been some interesting, extreme measures taken elsewhere in the past in a bid to reduce mess. The authorities in a small town in Madrid – called Brunete – have used 2 drastic tactics in the past for tackling their fouling problem. The first was to follow offenders down the street with a remote controlled dog mess, bearing the words “Don’t leave me – pick me up”. The following year the same authorities spent a week tracking down offenders and posting their dog’s mess to them in a town hall branded box marked as ‘Lost Property’. The latter was quite a success! A city in Taiwan rewarded everyone who handed a bag of dog mess in with a lottery ticket, per bag. Closer to home, in the UK, councils have been known to spray paint the dog mess in bright colours to shame offenders, stick flags in the mess with messages of shame written on them, and send plain clothes officers out in night vision goggles to catch those who think they can get away with fouling in the dark. British Waterways got involved in a town in West Yorkshire, where they decorated a tree with brightly coloured poo bags in a bid to highlight the issue. 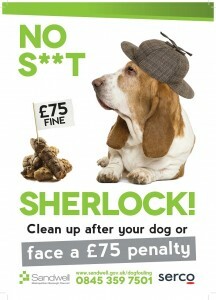 It has been found that around 70% of local authorities have a problem with dog mess in their area. 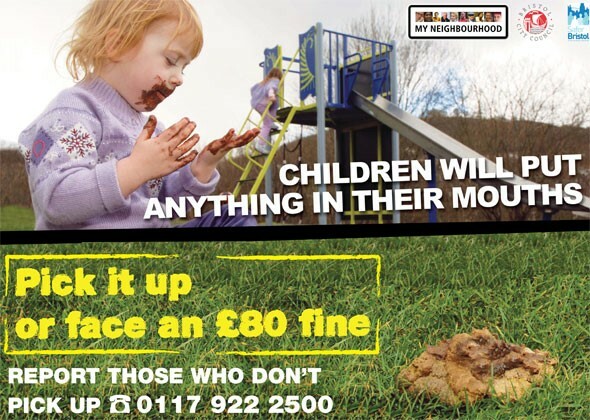 The posters illustrating this article are examples of some of the creativity and shock-tactics that are now being employed by individual councils across the country in the fight against dog mess on our streets. 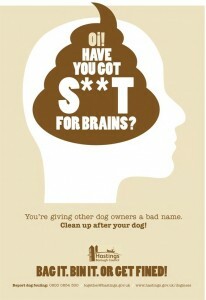 Get your free Dog Poo Fairy posters from Keep Britain Tidy today!